There is a vast range of traditional Mexican clothing, especially in relation to which state of Mexico the clothing is from. 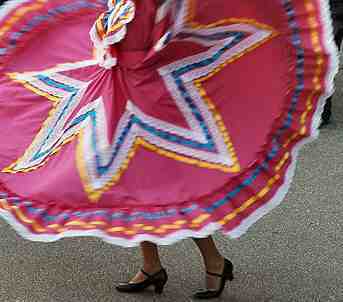 For example dresses used in Folk Ballet (Ballet Folklorico) have a full skirt in common (which flares out in the many turns of each dance, otherwise held out by the dancers themselves) come in a variety of color and embellishments. 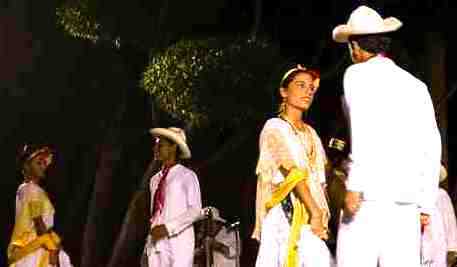 The two traditional dress styles I have seen the most of (and are easily recognizable) are the dresses of Jalisco and those of Veracruz used to dance the 'Son Jarocho'. This style of dress has become well-known among Westerners as 'the boho dress', worn by the likes of Sienna Miller. It is almost just a sack in shape, made from cotton, and embellished with intricate embroidery. They come in many colors., but white is the classic. 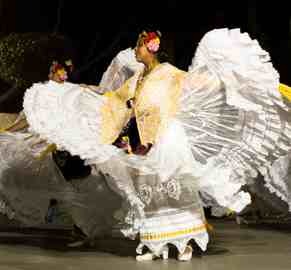 Puebla is the name of a city in Veracruz, from where this style dress originated. What has become the standard costume for mariachi musicians was originally the clothes worn by equestrian gentlemen. The workmanship seen in these clothes is often exquisite and, along with the suits of bull-fighters, the most ornamental of all Mexican clothing. These are status-driven suits, designed to show off wealth and prestige and to illicit respect and wonder whenever worn. (Think buttons) The metal decorations along the length of the pants. Usually gold or silver in color. Traditionally the more elaborate the botonaduras, the higher the status of the wearer. The infamous Mexican hat dates back to the 15th century. It gets it's name from the Spanish word for shadow/shade, sombra, it's brim being wide enough to protect you from the hot Mexican sun. The sombrero is well-known outside of Mexico, and often used as a gimmick at Mexican restaurants. And although westerners would identify large-brimmed, color-striped, straw hats as being a Mexican sombrero, the Mexicans I know wouldn't agree. They tend to identify the embroidered mono-colored cowboy-style hat as a sombrero. It's possible that Mexicans in the North would identify more with the straw hats as that is the area where straw sombreros were used. With sombreros as with other Mexican clothing items, the style varies from region to region. There are many different shapes to a sombrero, and different width of the brim. I love seeing men in sombreros. It's something that hasn't been common in the West for many, many decades; although now thanks to Justin Timberlake and other high profile musicians, the hat has made a comeback. Why not go for one of the many classy styles of sombrero, and donate your ridiculous-looking stripey-straw-thing to a local drama group. It IS possible to dress up as 'a Mexican' and look classy you know. They say when in Rome do as the Romans do, and if you want to have the most authentic lifestyle while in Mexico you really better dress like a Mexican. Especially in large populations like that of Mexico City, you'll be a lot safer if you look the part. Denim, denim, denim. Mexicans love the stuff. No baggy denim though, no flared jeans. Fitting jeans are best and those with extra details, embroidered motifs on the pockets or extra studs/domes for example, are popular. 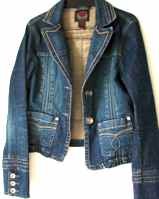 T-shirts are the norm on top, and denim jackets are common. Denim is most definitely the staple of modern Mexican clothing. One of the biggest trends on the European catwalks for 2009 - you guessed it, DENIM. And all the stone-washed detail is coming back. Basically, Mexican denim is a popular style worldwide.